What's your favourite Cheesecake Factory cheesecake? I’m ashamed to say I’ve never been to Cheesecake Factory. So good :-) your pick is also quite tasty and I’m the same as you actually. Not into sweets that’s much but cookie dough anything is my weakness lol. 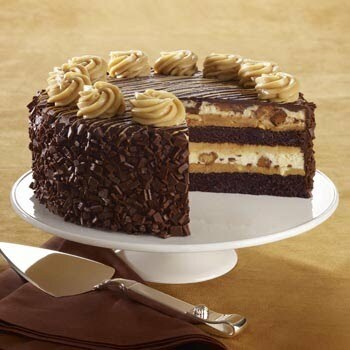 Celebration cheesecake has taken the mantle recently, but they may have the best chocolate cakes I can find. Layers of Vanilla Cake, Cheesecake, Strawberry, Chocolate and Vanilla Mousse with Cream Cheese Frosting. This one was never on my radar before and it actually looks deliciously amazing. I'll need to try this after I try the Hershey's one. Reese peanut butter cheesecake or 30th anniversary cheesecake. Oh it was so great. You're in for a treat. I ate the whole damn thing...AFTER having their chicken parm sandwich. No regrets. What the hell is a cheesecake factory? A Google search indicates that it's chain of restaurants..? I've only been once when i visited SF in march, i had the godiva one it was pretty great! Yes and they sell cheesecakes. They also have a full service menu that's mostly American cuisine and American classics. I haven't been to one in over a decade. I remember the carrot cake cheesecake being fantastic. I like to keep it simple - the Oreo cheesecake is my go to. Man, that is delicious. Reese's is my fav. Too bad they aren't freshly made though. They have too much selection for that to seem economically viable. I do wonder if they would taste any better, though. Red Velvet a la mode. Oreo and/or Reese's. I have a hard time ever trying anything else. Chocolate Tuxedo is the go-to, though I've liked all types that I've tried. And yes people, everyone knows that the Cheesecake Factory is probably the least healthiest restaurant that has ever existed, but it's a guilty pleasure of my wife and I(we go like maybe only once or twice in a year). America, what are you doing? This thread is a reminder as to why ice cream cake is the superior type of cake. The Godiva one by a country mile.